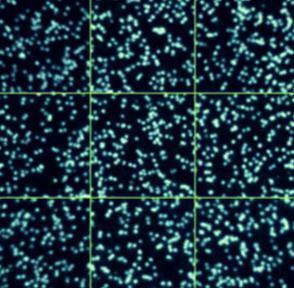 Human genomics promises to improve the diagnosis, treatment, and prevention of disease. The proliferation of genetic tests has been greatly accelerated by the Human Genome Project over the last decade. It is anticipated that genomics will bring physicians a powerful tool to discover the correlation between hereditary elements and environmental factors; however, the expected transformation to using genomics-based medicine will occur in stages as new tests are proven and integrated into practice. Genetic testing holds immense promise for diagnosis and treatment. Practicing physicians and health professionals need to be trained in the principles, applications, and the limitations of genomics. Genomic medicine Is the use of genomic information and its derivatives (RNA, proteins, and metabolites) to guide medical decision-making. It is an essential component of personalized medicine. Personalized medicine is a form of medicine that uses information about a person’s genes, proteins and environment to predict diagnosis and disease. The goal is to shift the emphasis in medicine from reaction to prevention. Personalized medicine introduces the ability to use molecular markers that signal disease risk or presence before clinical signs and symptoms appear. It offers the opportunity to focus on prevention and early intervention rather than on reaction at advanced stages of disease. In many areas, the clinical interventions can be life-saving and understanding of a disease process allows optimized prevention strategies. myGenomics® believes in a team approach to identify and care for patients at risk of hereditary cancer. There are many variables that affect clinical decision-making surrounding testing for this risk, including available guidance on who to test, accuracy of the results, and on-going support in developing a personalized prevention plan. myGenomics® has chosen to utilize the Illumina® platform for next generation sequencing, which is the most advanced technology with the highest standard of quality in the market today. Next generation sequencing (NGS) is a term that describes the most advanced type of DNA sequencing technology. NGS allows the ability for an entire human genome or just a particular area of interest to be sequenced within a single day. In contrast, the previous Sanger sequencing technology, used to decipher the human genome, required over a decade to deliver the final draft. NGS offers scientists the ability to capture a broader spectrum of mutations and evaluate genomes without bias on a highly sensitive technology platform. 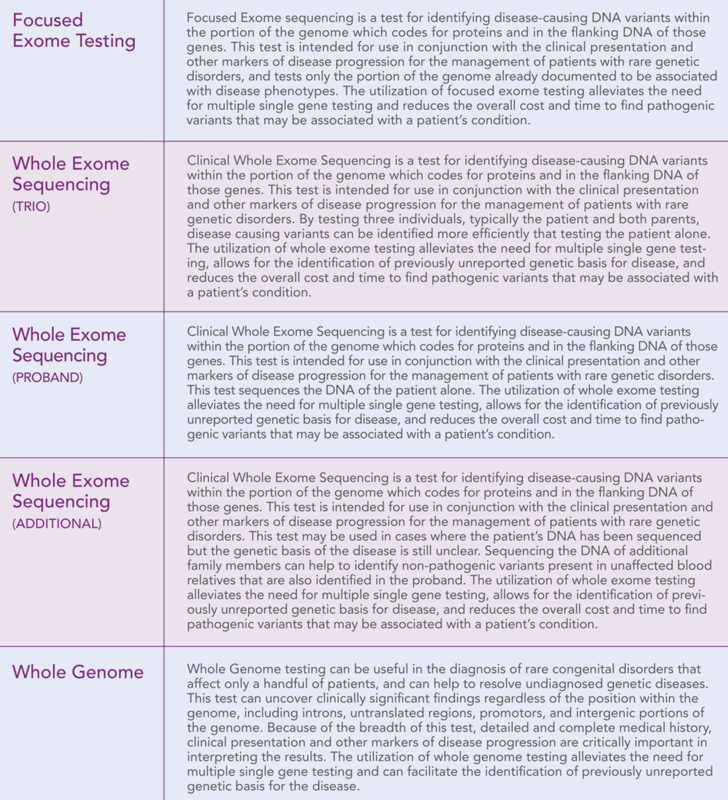 We can now approach genomic medicine in a more efficient, accurate and cost-effective manner. The Illumina® platform sequences by synthesis (SBS) technology, which delivers the highest percentage of error-free reads, with the majority of bases having quality scores above Q30. “Q scores” are used to measure base calling accuracy, one of the most important metrics for assessing sequencing data quality. Low Q-scores can lead to false-positive variant calls, which is a mistake no one wants to make when trying to decide on the next steps in preventing or treating hereditary cancer. 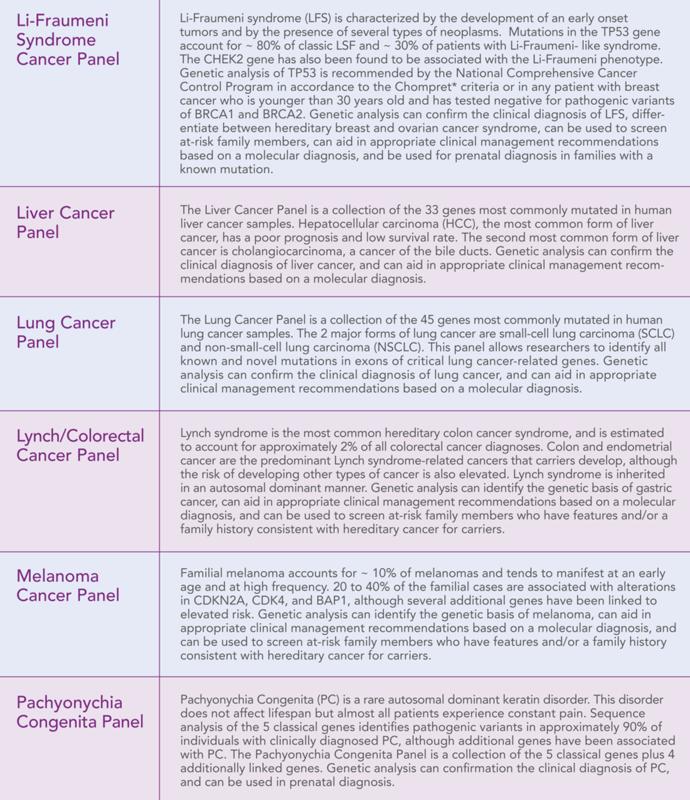 myGenomics® follows the recommendations of The National Comprehensive Cancer Network® (NCCN®) when offering guidance on patient criteria for testing. The NCCN® is an alliance of 27 of the world’s leading cancer centers, working together to develop treatment guidelines for most cancers, and dedicated to research that improves the quality, effectiveness, and efficiency of cancer care. *The NCCN Clinical Practice Guidelines in Oncology (NCCN Guidelines®) document evidence-based, consensus-driven management to ensure that all patients receive preventive, diagnostic, treatment, and supportive services that are most likely to lead to optimal outcomes. 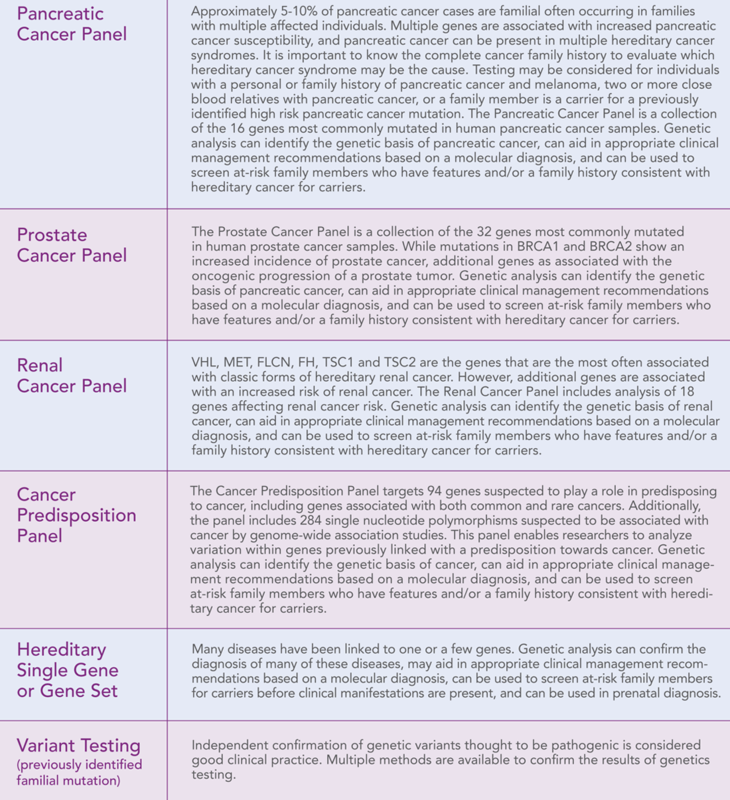 The person being tested has a personal or family history that suggests an inherited cancer risk. 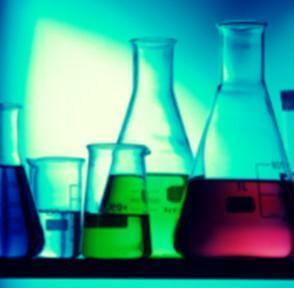 The test results can be adequately interpreted and a specific genetic change can be concluded. The results provide information that will help guide a person’s future medical care. 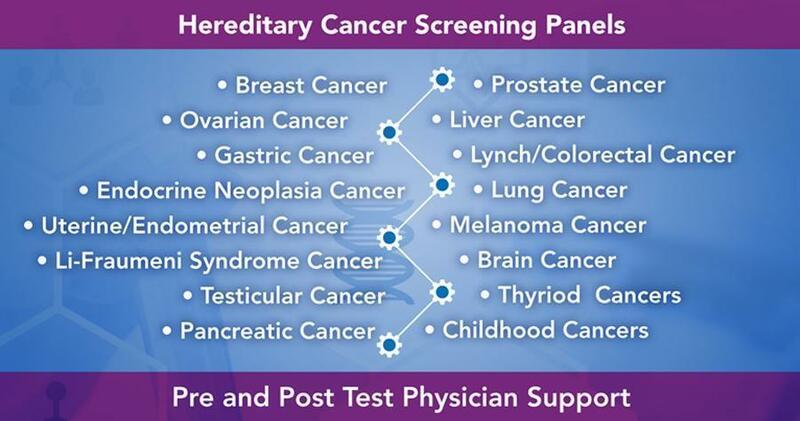 One of the most important aspects in providing access to hereditary cancer testing is being able to offer a support system for patients and physicians before and after testing. myGenomics® refers to this as the Personalized Prevention Plan and has established vital partnerships to assist both the patient and physician. Abandon the cure-driven approach and move toward personalized proactive prevention. Assessment criteria based on medical society guidelines. For these individual medical society guidelines, go to www.nccn.org. Family members include first-, second-, and third-degree blood relatives on both your mother and father’s sides. There are three possible outcomes of genetic testing: positive, negative and variant of uncertain significance(VUS). We recommend that all patients who undergo and or consider genetic testing should receive genetic counseling or speak to a qualified genetics expert to understand the implications of testing and results. provide a sense of relief for the altered gene. reduce the need for, or at least the intensity of, check-ups, screenings and preventive therapy. earlier disease detection through more targeted screenings and surveillance. more aggressive education on the signs and symptoms of a particular cancer. consideration for risk-reducing surgeries and/or therapeutic agents. participation in investigational imaging and screening studies, when available, in the context of a clinical trial. behavioral changes to lower the chance of developing the disease. patients making more informed decisions about their future health. feeling angry, depressed, anxious or guilty about the results. tension within a family because the results can reveal information about other family members in addition to the person who is tested. It may also put pressure on other family members to be tested. Individuals have a moral obligation to communicate genetic information to their family members. Genetic health professionals should encourage individuals to communicate this information to their family members and support them through the process. 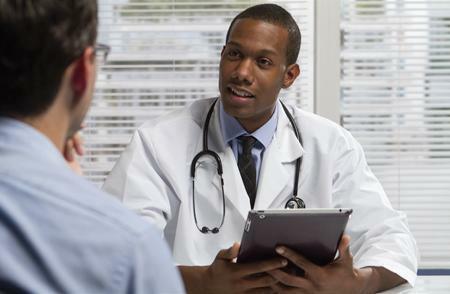 Primary care physicians play a vital role in detecting a patient’s risk of developing a hereditary cancer and can easily screen for this during routine patient visits. educating patients about hereditary cancers and available resources. obtaining a multigenerational genetic family history for each patient. providing a referral to a genetic health professionals when necessary. offering hereditary cancer testing when indicated. 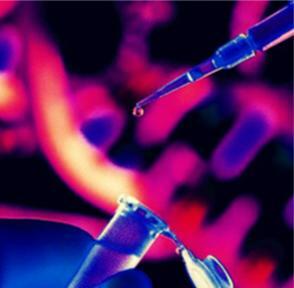 Genetic testing is expanding rapidly to become part of mainstream medicine. Increasing use of genetic testing requires providers to be knowledgeable regarding ethical, policy, and practice issues in order to minimize risk for harm, protect the rights of individuals and families, and consider societal context in the management of genetic test results. 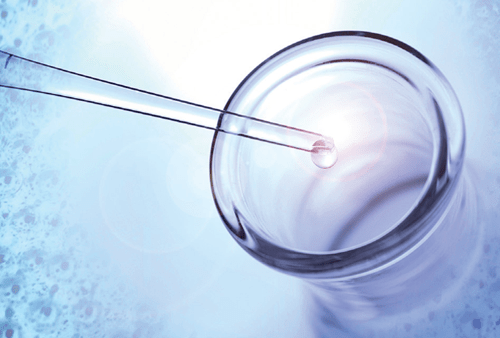 However, many primary care providers do not feel sufficiently equipped to meet this growing demand of incorporating genetic medicine into practice. 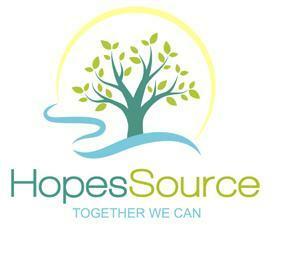 support patients and their families through the process of deciding if hereditary testing is right for them. provide patient education and ongoing resources to gain further knowledge and understanding of the new developments surrounding hereditary cancers. schedule appointments for patients to connect with a genetic expert for consultation and counseling. facilitate the prior authorization process with the patient’s insurance to determine coverage and the patient’s financial responsibility. 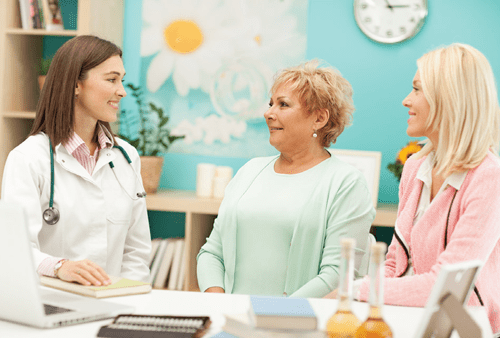 connect you to peer physicians specialized in Genetic Medicine who will partner with you to develop an ongoing Personalized Prevention Plan for your patient. myGenomics® would like to partner with you to seamlessly integrate hereditary cancer testing services into your practice! 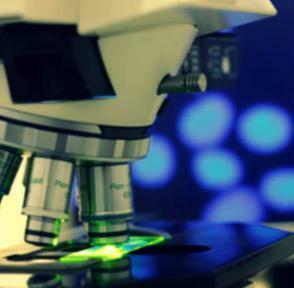 We are confident that our advanced technology, unique patient support platform and genetic expert access will provide you with the tools you need to be proactive in the fight against hereditary cancers. Please enroll today at www.mygenomicspartner.com. 1. National Cancer Institute. SEER Cancer Statistics Review, 1975-2009: Lifetime Risk Tables (URL: http://surveillance.cancer.gov/devcan) [May 2013 accessed]. 2. PNAS 2011;108:18032, 2011. 4. Lynch HT, Smyrk T, Kern SE, et al. Familial pancreatic cancer: a review. 4. Baglietto L, et al. Risks of Lynch syndrome cancers for MSH6 mutation carriers. J Natl Cancer Inst. 2010 102:193-201. 5. Begg CB, et al. Genes Environment and Melanoma Study Group. Lifetime risk of melanoma in CDKN2A mutation carriers in a population-based sample. J Natl Cancer Inst. 2005 97:1507-15. 6. Provenzale D, et al. NCCN Clinical Practice Guidelines in Oncology® Genetic/Familial High-Risk Assessment: Colorectal. V 2.2014. May 19. Available at http://www.nccn.org. 7. Pharoah PD, et al. International Stomach Cancer Linkage Consortium. Incidence of stomach cancer and breast cancer in CDH1 (E-cadherin) mutation carriers from hereditary diffuse stomach cancer families. Gastroenterology. 2001 121:1348-53. 8. Cybulski C, et al. A large germline deletion in the CHEK2 kinase gene is associated with an increased risk of prostate cancer. 9. Berliner JL, Fay AM. 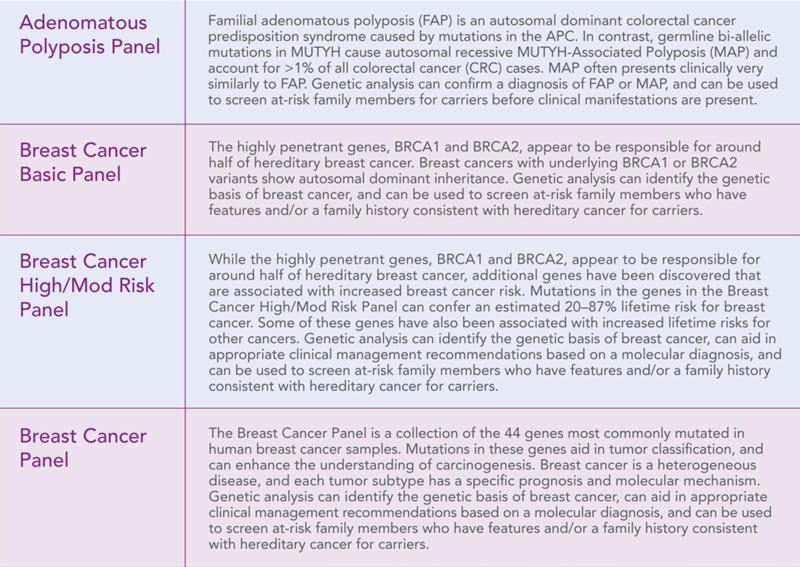 Risk assessment and genetic counseling for hereditary breast and ovarian cancer: Recommendations of the National Society of Genetic Counselors. 10. J Genet Couns 16(3):241, 2007. 3. Walsh T, Casadei S, Lee MK, et al. 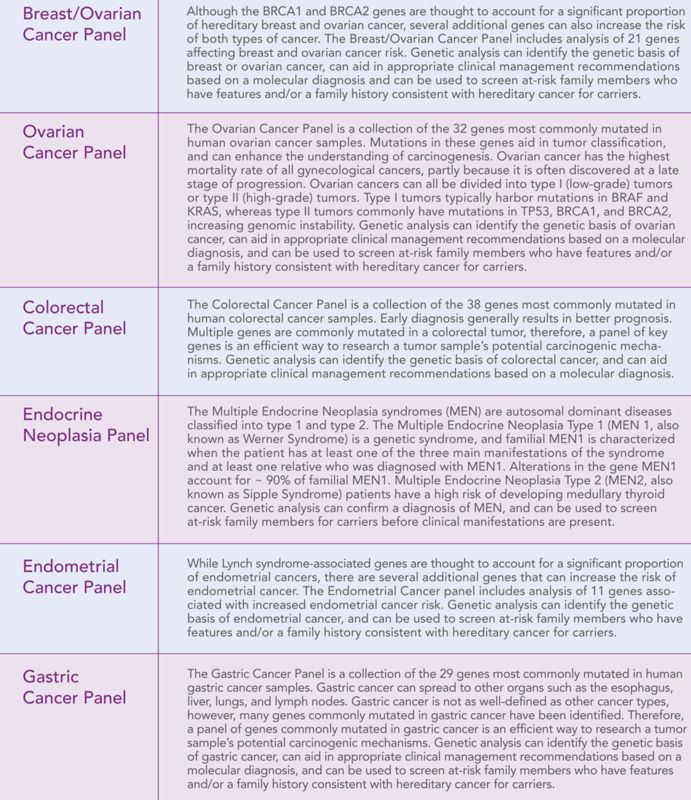 Mutations in 12 genes for inherited ovarian cancer, fallopian tube, and peritoneal carcinoma identified by massively parallel sequencing. 11. NCCN Clinical Practice Guidelines in Oncology (NCCN Guidelines®): Genetic/Familial High-Risk Assessment: Breast and Ovarian. Version 2.2015., Assessment: Colorectal. Version 1.2015., Assessment: Gastric Cancer. Version 3.2015.